NEW! If you're on facebook and would like to include a link to your facebook profile, you can update your current information and we'll include it on our website. If your class has a facebook group or page, please send us the information and we'll post the link on your class page. VIEW OR PURCHASE PHOTOGRAPHS FROM THE NOVEMBER 29TH GALA! This free website has been established as a place for classmates to find each other, to post old photographs and to share information. 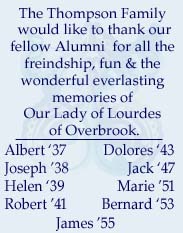 Please use the menus to find old classmates by graduation year, to add your information and to view photographs. Share the memories. We'd love to have more class photos to put on the website. Please upload scanned photos via this website. 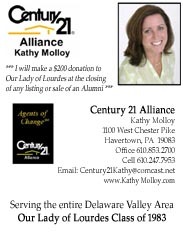 Read the wonderful article from the Philadelphia Inquirer about the April 27, 2008 Opening Celebration Mass. Come one and all to bid farewell to our alma mater. She has served us well for over 105 years. Join family and friends for the last walk down memory lane thru the classrooms of our younger days. Kindly respond no later than April 30th for both events. 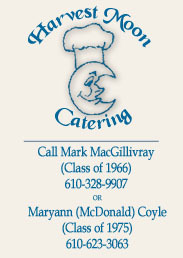 301 South Cedar Lane Upper Darby, PA 19082.
if you wish to attend the Beef and Beer. 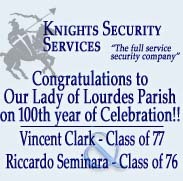 All proceeds from advertising on this web site go directly to Our Lady of Lourdes School. The maintenance and handling of these ads is being done as a fundraiser by friends and alumni of Our Lady of Lourdes School. We thank you for your participation. The cost of advertising on this web site is $300 per year. From now until October 31, 2008, we have special prices to have your ad placed in our 100th Anniversary Program Book and/or displayed on our website.